It is really gratifying when an investment performs better than expected, but if a holding gets too big as a proportion of your portfolio it can cause problems in the long run. When a share or fund increases significantly in value, its weighting in your overall portfolio increases. This can make your portfolio too heavily exposed to one type of asset class or sector. Imagine you constructed a portfolio with a 60% weighting to equities and a 40% weighting to bonds. If equities perform strongly, the weightings could drift to 80% equities and 20% bonds, making the portfolio riskier. ‘Many investors are over-exposed to a particular asset class, investment fund or individual share and should take action to address this,’ says Patrick Connolly, certified financial planner at Chase de Vere, an independent financial adviser. It might feel counter-intuitive to sell down shares in a stock that is performing well and boosting your overall investment portfolio. But even seemingly strong and secure companies can get into difficulties. ‘For most people the best approach is to hold a balanced and diversified investment portfolio and this simply cannot be achieved if you have too much of your money reliant on the performance of just one company,’ says Connolly. Another potential issue with large investment holdings is that you could get stung with a hefty capital gains tax (CGT) bill when you come to sell the investment in the future, assuming it is not held inside a tax wrapper such as an ISA. CGT is payable on the money you make from selling assets, including shares and funds. You pay CGT on gains above your tax-free allowance, which is currently £11,300. Basic-rate taxpayers pay tax at 10% and higher-rate taxpayers pay tax at 20%. There is no CGT payable on assets held within an ISA. Adrian Lowcock, investment director at investment company Architas, says if you’ve got a large holding outside of an ISA you could sell a bit of it each year, ensuring you remain within the CGT allowance, and then move the proceeds into an ISA. to take advantage of their tax-free allowance. Assets sold or gifted to a spouse are exempt from CGT. In some instances it’s possible to carry forward a capital loss from less successful investments to offset capital gains. However, Russ Mould, investment director at AJ Bell, says basing your investment strategy solely around tax is rarely a good idea. ‘That is really letting the tail wag the dog and in an ideal world you would keep portfolio churn to a minimum, so as to avoid commissions, dealing costs, spreads, stamp duty and the other frictional costs which can be incurred and erode total returns from your portfolio,’ he says. WHAT COUNTS AS A LARGE HOLDING? Having more than 10% of your portfolio in one share should be a cause for concern. Mould says any type of holding above 10% requires careful monitoring at the very least, in the context of your overall investment strategy, target returns, time horizon and appetite for risk. 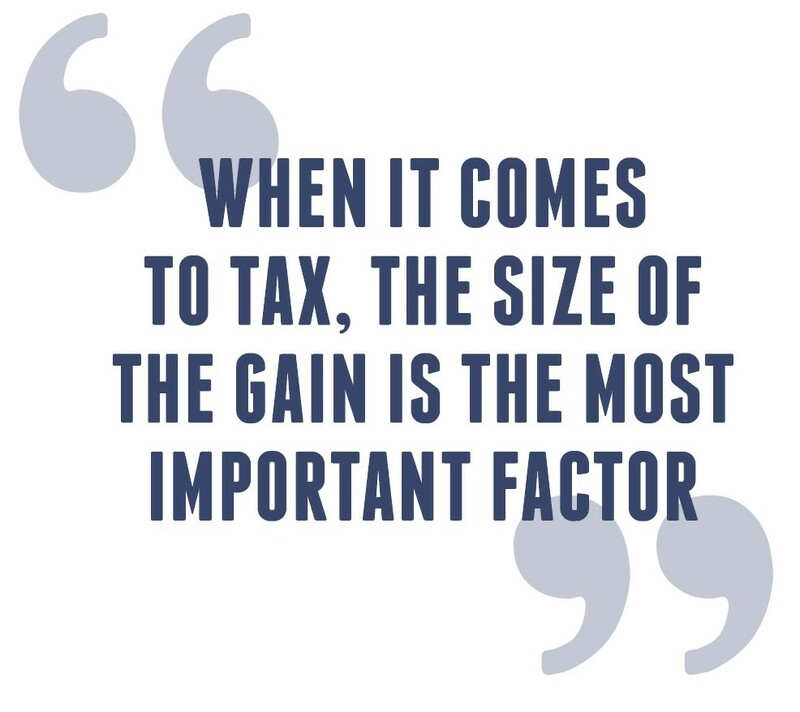 When it comes to tax, the size of the gain is the most important factor. ‘A holding worth £100,000 might be easy to reduce if the gain is only £5,000, but will be harder to sell without paying tax if the gain is £95,000. Given the personal CGT allowance is £11,300, it would take a number of years to exit the holding in order to avoid paying tax,’ says Lowcock. WHAT SHOULD I DO WITH THE PROCEEDS? Putting the proceeds into an ISA is a good starting point. Which investments you choose will depend on your rationale behind trimming the holding. ‘If it is sold purely on the basis of reducing a specific position that has become too large, but the sector as a whole retains attractions, you should invest in something similar,’ suggests Andrew Herberts, head of private investment management at Thomas Miller Investment. If you trimmed the holding because your portfolio became too exposed to a particular sector, then you shouldn’t buy a similar investment to the one you sold. Many experts advise putting the proceeds of investments that have performed well into those that have done less well. This puts the weight of each asset class back to its original state. ‘For those who are concerned about achieving adequate diversification in their portfolio, it could be sensible to consider buying investment funds rather than individual shares,’ says Connolly. IS THERE A GOOD TIME TO TRIM LARGE HOLDINGS? It would be preferable to trim a big position after it has done well, rather than after it has had a tumble. But timing the markets is extremely difficult – even professional investors get it wrong. Lowcock says it’s important to remember you’re only trimming the holding so you will still have exposure to any longer term recovery in the investment. ‘In the grand scheme of things, even trimming after a fall is unlikely to have much impact. Large falls are likely to be replicated across the market – so it means you can buy other stocks cheaper as well,’ he explains. Timing sales to mitigate CGT liability is a sensible move, as is ensuring you don’t miss out on valuable dividend or coupon payments. Will the market sell-off prompt investors to look at value investing again? How could a slowdown in life expectancy growth impact your retirement planning? Will Dignity be able to update on new pricing strategy? How challenging will 2018 be for Hikma?